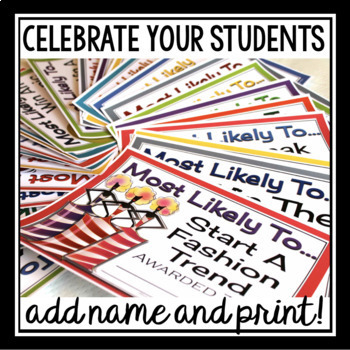 END OF THE YEAR AWARDS: End your school year by giving your students these 30 ready-to-print most likely to awards! All you have to do is print, sign/date, and you are done. Click the preview button under the product images to see a few examples of the awards! Want even more awards? Click HERE to see volume 2! ♥ Just what I was looking for to do something fun and silly at the end of the year!! GREAT IDEAS! THANK YOU SO MUCH! ♥ FABULOUS! Kids LOVED them. Was a great way to end the year and say goodbye. 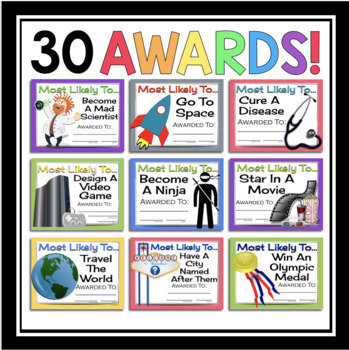 ♥ These are absolutely hilarious. 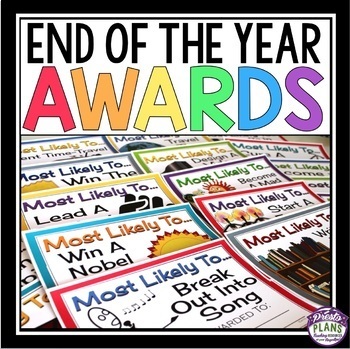 I loved looking through them and then deciding what students fit which award. The kids were entertained too.